Very High Quality And Shatter Proof Of Course. A: The Only Anti Fog Feature Of This Mirror Is That Its Made From A Material That's Heats Up Easily In The Shower, It Isn't Treated With Any Harmful Chemicals (That Wash Off After a Few Weeks Anyway). 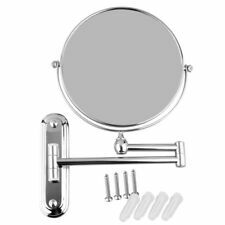 The best shower shave mirror due to its unique design Shower Shave Mirror. Portable Shower Mirror allows you to remove the mirror for hand held shaving or travel, so you can see your face and get the smoothest shave possible everywhere you go. Elegant design, would be suitable for any family and hote bathroom,etc. -Besides, the mirror has doubles sides, one side is a standard mirror and the other side is a 5 x magnifying mirror. 1x wall mounted mirror. Der zweiseitige Schminkspiegel verfügt auch über eine normale Seite, ohne Vergrößerung. Schminkspiegel stehend. • Präzise Gesichtspflege dank 2-fach Vergrößerung. • Zweite Seite ohne Vergrößerung für normale Ansicht. 5.360° adjustable of the mirror and the stand, you can adjust for the best angle. 1 x Mirror. 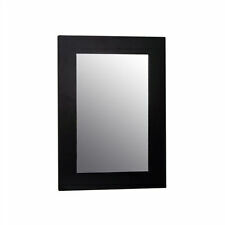 Wall-mount mirror,easy to install, it can be used in bathroom, bedroom and dressing room, etc. Type: Double Side. 1 x Mirror. We'll do our best to help you solve the problems you may have. We will work with you to until you are satisfied. We do not know how much they will be. Our price does not include these fees. At Executive Shaving we want you to get the best shave possible, if you have any queries or need any advice just get in touch. On one side there is a 10x magnification mirror and on the reverse is a non-magnifying mirror. 1 x Mirror. Deck stand. We'll do our best to help you solve the problems you may have. We will work with you to until you are satisfied. We do not know how much they will be. Our price does not include these fees. Material Brass. 1 x Square Mirror. We'll do our best to help you solve the problems you may have. We will work with you to until you are satisfied. Suitable place. We do not know how much they will be. 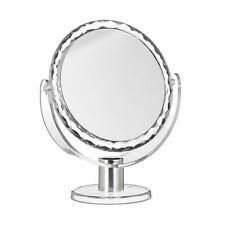 Free Standing Vanity Dual Side Bathroom Make Up Mirror 3x Magnification 6"
Solid construction, weighted pedestal. - Dual sided for both regular use and magnified(3x) use. - Free standing, no construction setup. 1x makeup mirror. Ein nützliches Accessoire für den gehobenen Anspruch in praktischem Taschen-Format. - BEZAUBERNDER HANDSPIEGEL "JUNGFRAU" -. Sofas, Sessel, Wohnlandschaften & Betten. Möbel & Dekorationen im Industrialdesign. Palazzo Int ist einGroß- und Einzelhandel für historische Einrichtungen aller Art. Das Konzept „ Antiquitäten von Morgen für Jedermann“ erwies sich als ein viel versprechendes Motto mit Zukunftsperspektive. Advanced rotation so you Mirror Rotates 360 degree for adjustable angles allowing you to position the shower shaving mirror in whichever direction that’s needed. With 360 degree rotating arm and powerful locking suction. 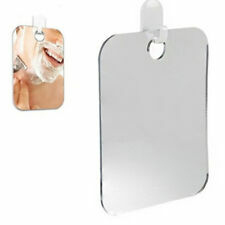 Magic Shave No Fog Shower Mirror with Free "Magic Hook" - Uses No Adhesives! New 3 Piece Decorative Mirrors Set – Antique Bronze Finish! Easy to hang. Mounting hardware included! Add an elegant touch to any room clean! Due to photography and screen display capabilities, exact colors may vary slightly. These mirror demisters are adhesive heating pads, when installed onto the back of mirror. They provide heat energy, which transfers directly to the mirror, resulting in a warming of mirror surface. Easily can be connected to the bathroom light then can be switched on and off with bathroom light switches or separate switch can be installed. Demist power. Byecold LED Illuminate Defogging Vanity Mirror with Weather Temperature Date Humidity Display Makeup Bathroom Wall Mirror. LED Illuminate Light- Bright enough for makeup, choose the sleep mode, the screen system will automatically reduce the brightness, energy saving and not affect your sleep. Montieren Sie den Badhängeschrank je nach Bedarf mit dem Türanschlag auf der rechten oder linken Seite. Im großen Spiegel entgeht Ihnen nichts. Praktisch: Der Hängeschrank vereint die Möglichkeit zur Aufbewahrung mit einem nützlichen Spiegel. 2 teiliges SetDer Wandspiegel hat folgende AbmessungenAußenmaße: ca. 44 x 38 cm.Spiegelfläche: ca. 29 x 22 cmRahmengrösse ca. 9cm, Tiefe ca. 4 cmMaterial : Poly-Nature - Spiegelglas -Mdf RückplatteKonsoleabmessungenBreite ca. 31 cm - Höhe ca. 12 cmMade in Italy. Miroir à main Alchemy Gothic "Kraken". Hand mirror Alchemy Gothic "Kraken". Finition à la main de haute qualité en résine à effet argent antique. New in box. back to the Lovecraftian depths. The terrifying leviathan with tentacles rises from the abyssal depths of history to bring the imprudent soul. 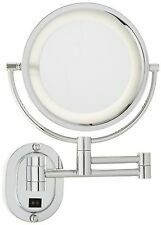 Knightbridge - LED Illuminated Bathroom Mirror with Dual Shaver Socket RCTM2LED | Electrical World. Electrical World Outlet > Knightbridge - LED Illuminated Bathroom Mirror with Dual Shaver Socket RCTM2LED. LED Bathroom mirror. LED surround bulbs for longer life and equal light distribution;. [Material]: LED lamp account; Carbon iron alloy; glass mirror. Makeup mirror with LED light 1 unit 6 ". Light tabletop makeup mirror;. Zadro Z'Fogless Travel Shower Mirror Caddy. 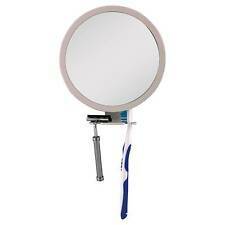 The Ultimate Fogless Travel Mirror. Folds to compact size. Mirror cover unfolds into shower caddy and razor holder. Fogless Mirror. Great for tweezing, makeup application and shaving! Espejo de pared Espejo de baño barroco Espejo antiguo Armario Espejo Decoración de pared de plata. Hall espejo repisa espejo plata espejo barroco espejo de pared antiguo espejo deco. Espejos de suntuosos estilo barroco. Lights: White; Warm. Warm Light: 2700-3500K. 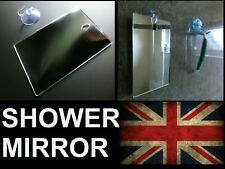 -High quality 5mm silvered HD mirror, waterproof and anti-oxidant. Thickness of mirror: 5mm. 1 x Mirror. - Due to different producing batches, product details might be a little different. Dank stabiler Saugnapf-Halterung haftet er an allen glatten Oberflächen und das ganz ohne zu Bohren! Konsole & Zubehör. XXL Design Handbrause | Regendusche | Kopfbrause | Duschkopf | DuschbrauseEUR 16,99.